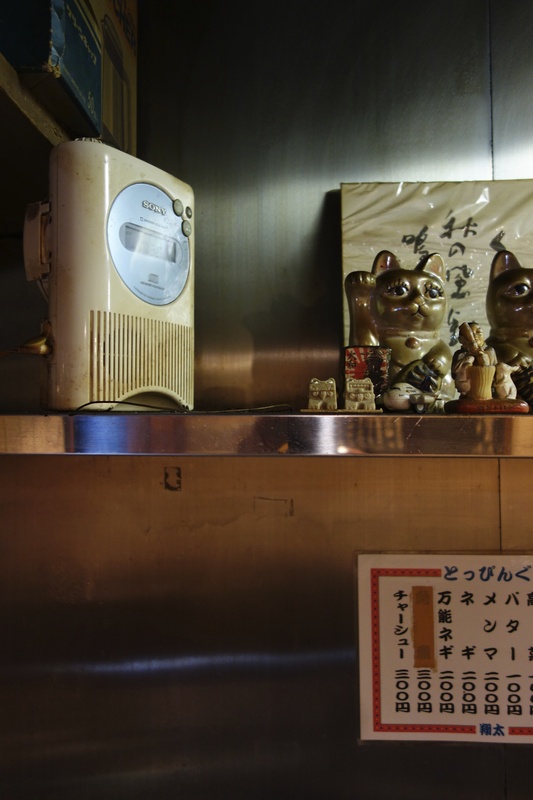 A tall woman perhaps in her late 20s slips in under the noren at Shouta Ramen and angles for the counter. 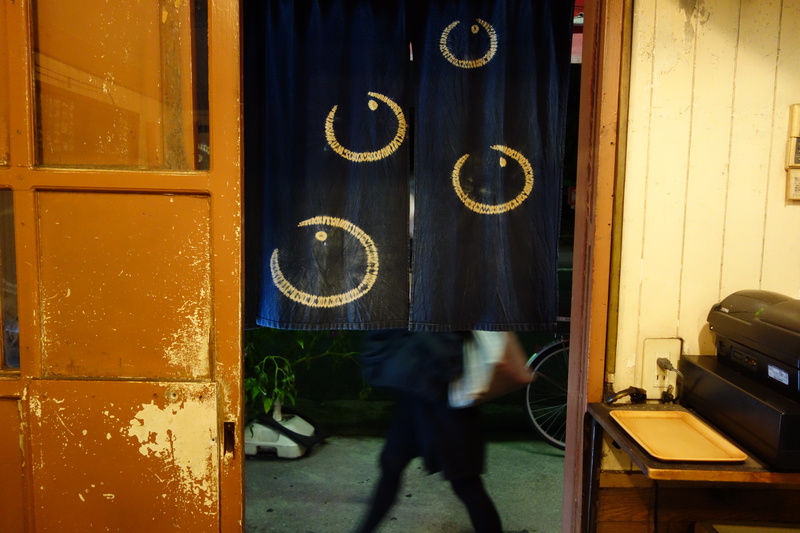 She makes three the number of customers here this eve. She’s wearing white jeans and a shell-colored satin top. She has a big ponytail and large gold framed glasses. Something about her abrupt movements, a sort of determination as she aims for her seat, suggests she isn’t Japanese. Perhaps her focus is steeled by the fact that the only other people here are men. When she orders, her accent is Chinese. Shio salt-based ramen and a plate of cha-shu roast pork, she says. She eats quickly, pays and leaves. The master says, I get a lot of Chinese customers these days. People come in and order the same thing. Shio ramen and cha shu. They must have a network. Can’t complain, they’re good customers. They can’t be demanding because they barely speak Japanese. I tell ’em, you know you can have free seconds on the noodles, and they go huh? They can’t be demanding because they barely speak Japanese. I tell ’em, you know you can have free seconds on the noodles, and they go huh? 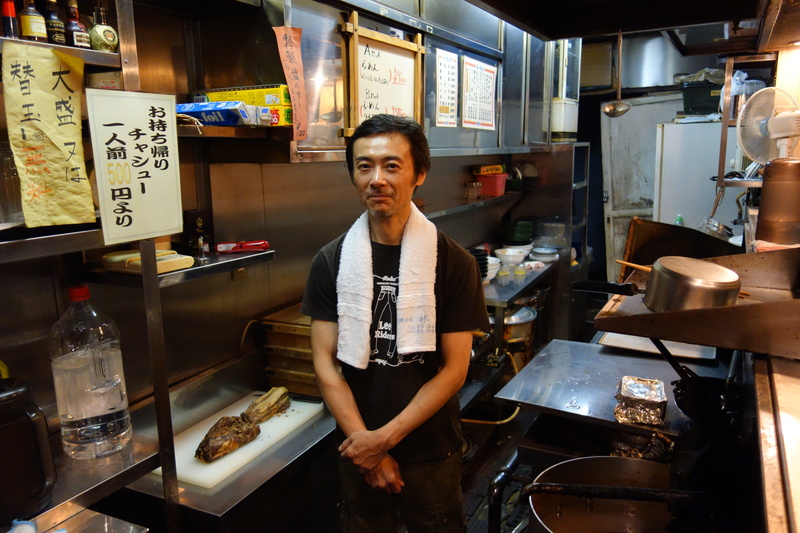 Shouta — you call him that, because he doesn’t want to be named, though Shouta’s his son’s name — opens every day except at new year, and before new year he sells 15 to 30 slabs of his fall-apart cha-shu tenderloin by the kilo. It’s his specialty, alongside the tomato ramen. 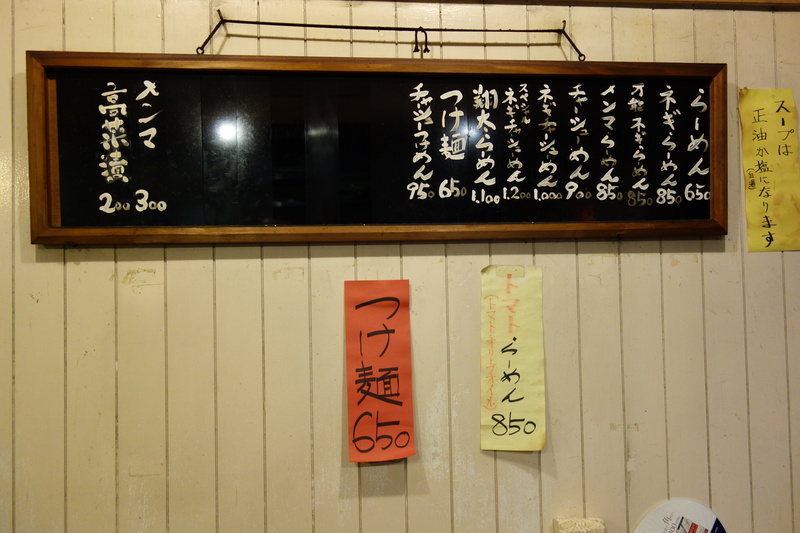 There is also his standard shoyu ramen, tasty with a topping of bannou negi chopped spring onions. His noodles are thin and creamy white like you find in tonkotsu, and his soup is chicken and pork to which he adds his tare essence, an intense brew of katsuo- and saba-bushi, niboshi, kombu and shiitake. It’s a cultural meeting, he says, the soup is Western, the tare Japanese. That’s why olive oil, garlic and butter work with it. He’s been going 16 years here. He’s seen a few changes. Highballs became popular as Suntory promoted their comeback a few years back. Then Suntory put up the price of its kaku yellow label whisky. The Chinese woman has left, so has the younger salariman who was reading a book. The master lights up a Peace. You drink the cold water. The water tastes good. He says, these days everyone’s divorced. I go to my son’s baseball and half the kids are from single mums. Some nights at this counter, there’ll be five or six customers and everyone’s a divorcee. He laughs, Wipes some sweat away. He says, Women are emboldened to split now. They used to be uneasy about it. Now they say to their husbands, I don’t want to look at you. Well, I’m all right, so far. Haha. Too tired to fight. Haha. But the Bank of Japan is saying the economy’s getting better. I reckon more people will get divorced. The station on the waterproof shower radio keeps up a drone of commentary, weather, and old hits in that clipped, movie-like voice. It sounds as Showa-era as it looks. Outside the night swelters. You can see people’s legs as they pass anonymously.